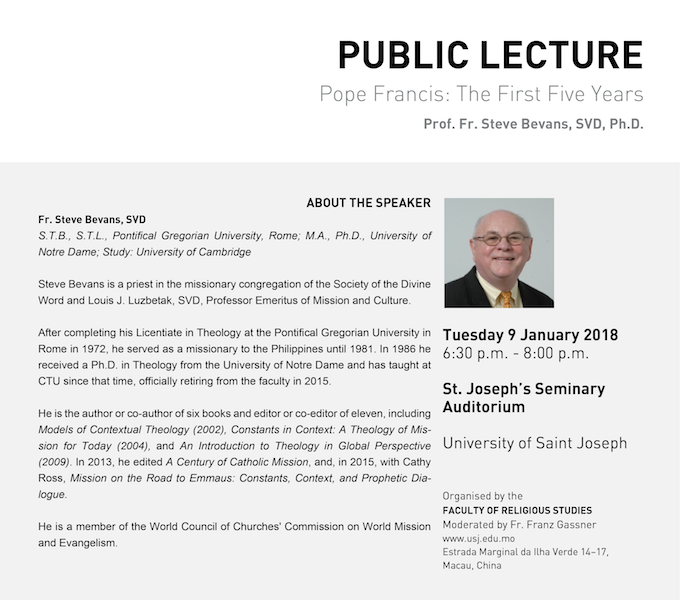 Steve Bevans is a priest in the missionary congregation of the Society of the Divine Word and Louis J. Luzbetak, SVD, Professor Emeritus of Mission and Culture. After completing his Licentiate in Theology at the Pontifical Gregorian University in Rome in 1972, he served as a missionary to the Philippines until 1981. In 1986 he received a Ph.D. in Theology from the University of Notre Dame and has taught at CTU since that time, officially retiring from the faculty in 2015. He is the author or co-author of six books and editor or co-editor of eleven, including Models of Contextual Theology (2002), Constants in Context: A Theology of Mission for Today (2004), and An Introduction to Theology in Global Perspective (2009). In 2013, he edited A Century of Catholic Mission, and, in 2015, with Cathy Ross, Mission on the Road to Emmaus: Constants, Context, and Prophetic Dialogue. He is a member of the World Council of Churches’ Commission on World Mission and Evangelism.